Melbourne, Fl Sunday, April 7, 2019 – Reception at the Springs of Suntree Clubhouse at 4pm. 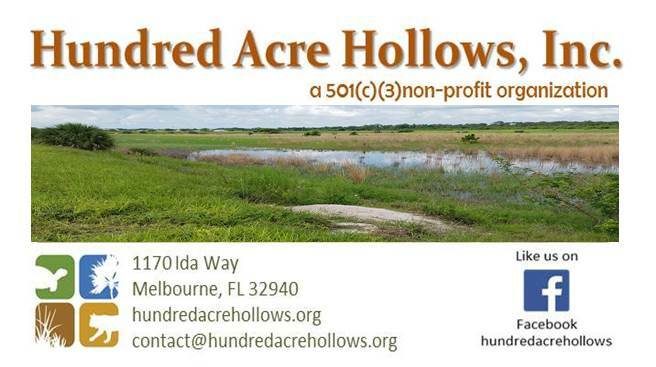 We will share information at 4:30 about Gopher Tortoise Day on April 10th as well as Hundred Acre Hollows. At 5pm walk 2 blocks to the grassy lot entrance to the Hollows at 1170 Rock Springs Dr for the ribbon cutting approximately 5:30. See the native plant garden and walk up to the berm to view the 114 acres. Stroll around a berm or the 1.8 mile entire space. Come see all the wildlife in the basins and add birds to your count. We recommend close-toed shoes, sun hat, sunscreen, water bottle and and bug spray. The clubhouse will be open to use the restrooms as there are none at the Hollows. People are welcome, so no pets, please. A golf cart will be available for those in need and some lawn chairs will be available. In case of inclement weather, the ribbon cutting will be held at the clubhouse.